Description This game is aimed at Key Stage 1 aged children. It is a point and click adventure game with lots of entertaining animation. 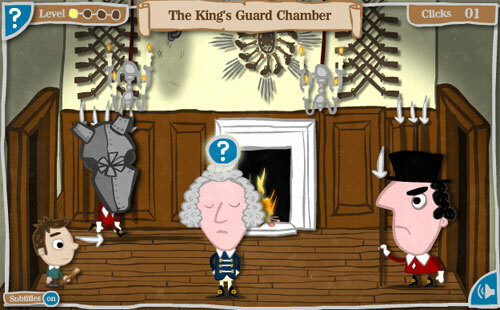 You navigate through rooms in Hampton Court Palace, interacting with other characters and solving a simple puzzle in each room before you can proceed. Every morning, Mr Nice brings frothy hot chocolate to King William III but Mr Nice has left the royal frothing spoon behind. Your job is to get the frothing spoon to Mr Nice before he serves the hot chocolate to the King! Use your mouse to click and navigate your way through the levels.